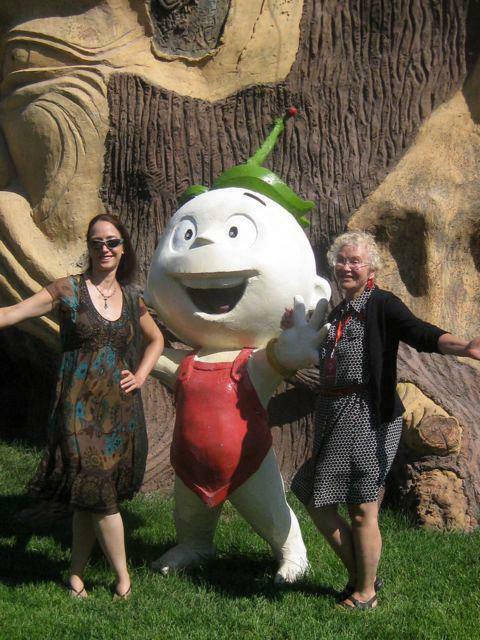 Trina Robbins Nominated for Eisner "Lifetime Achievement Award"
Our beautiful and talented friend Trina Robbins is up for a Lifetime Achievement Award at the Eisner's this year. 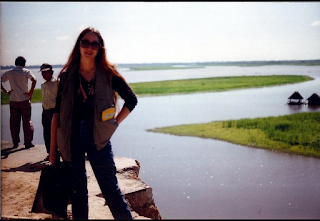 She's not done by a long shot, but even now, her efforts as a writer and historian in the field are unsurpassed! 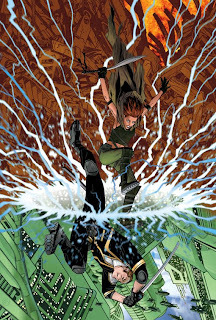 :-) If you are a comic's industry professional, be sure to vote at: www.eisnervote.com Not much time left to vote! Time to Pack your Trunk! This weekend--Cons Coast to Coast! Golden, Texeira, Calero, Ramos, Meyers, Triano, DeCarlo! 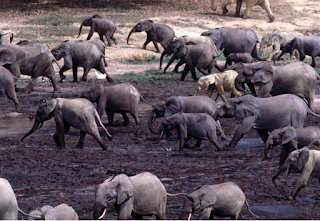 Eva Ink Artist Group Appearances Stampede the Continent! New York to Seattle-- Someone didn't get the notice about this weekend being taken, which means that there are at least 4 conventions I know of spread across the USA. Bad News: We had to choose just WHERE to be. News: Golden,Tex and Ramos will be sketching at the show as well as offering sketchbooks and special prints. Renee will have copies of her books, including "Nick Cardy:The Artist at War," and will be the Eva Ink rep the show if you have questions. 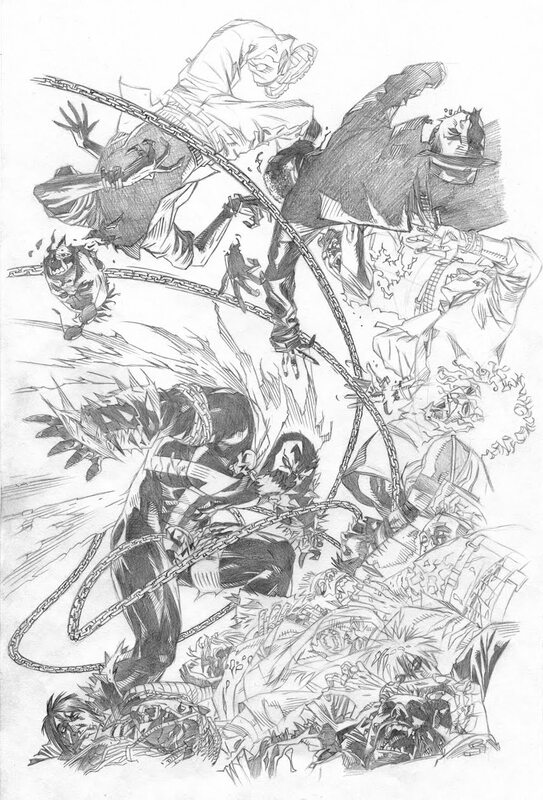 Golden is currently doing covers for Spawn, Image and Boom, among much more, while working on interiors to be announced soon. Texeira is currently working on a new Marvel mini-series, "Space: Punisher." News: This is a panel heavy convention. When not at their table in the dealers room, look for some fantastic programming. The artists will be sketching and selling artwork. Ric is debuting his new movie this year,"Kung Fu Movie, Movie" and book to go along with it. 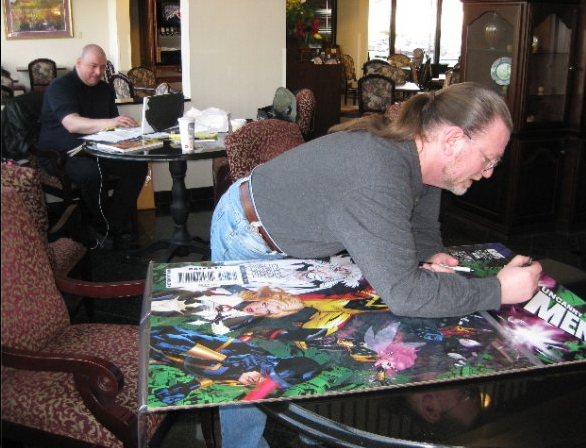 Matt is busy working for Zenescope, Upper Deck and more to be announced soon. Constance Katsafanas will be representing Eva Ink at this show. Ask her anything you need to know. 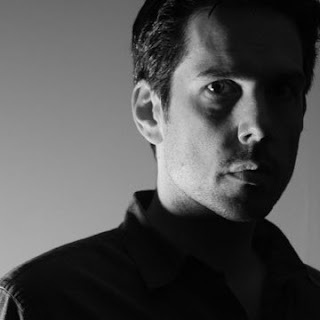 News: Dennis is currently working on "Captain Victory" and doing the cover duties for "Long Ranger" and "Witchblade." He will have some great new monster related prints at this show. News: Steve will be sketching at the show. Currently doing sketchcards based on Marvel Characters. Here are some handy packing tips for my road warrior friends. Traveling to as many comic book conventions and other expeditions that I find myself on, I'm always looking for tips. 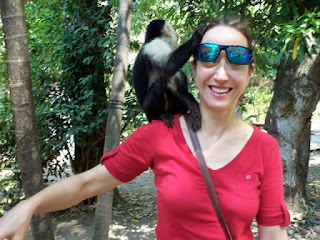 Here's another tip.If you are heading to Central America or the Amazon, why not go to your local thrift shop and buy clothes for the trip that are functional, but you aren't going to bust a gasket if a cheeky monkey rips your sleeve while trying to steal your glasses (yes, I'm talking from experience here). And you help a charity at the same time. Folding flats.... hum.... I need some of those! Fashion shouldn't be short on function—especially for travelers. The best-dressed road warrior isn't the guy who looks like he just stepped off of a photo shoot. He or she is the one armed with the smartest travel clothes: garments that pack well, wrinkle less, and perform all kinds of practical functions, from keeping bugs at bay to concealing money and valuables. 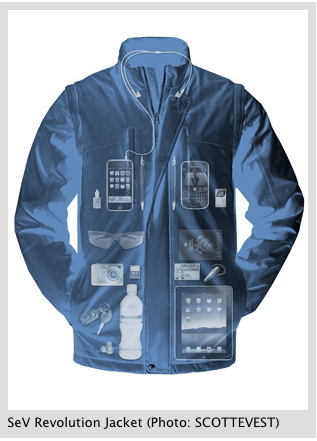 Here's another garment that helps conquer baggage fees: SCOTTEVEST travel jackets, which basically double as carry-on bags. The SeV Revolution jacket, which sells for $175, has a whopping 26 pockets, as well as a removable hood and removable sleeves (it turns into a vest). And it's not a bad-looking coat, either. 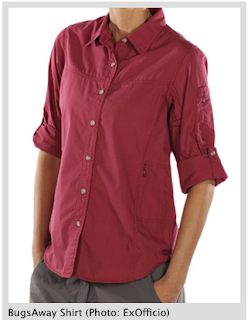 We're a little bummed, however, that the 26-pocket jacket isn't available for women. The maximum amount of pockets on offer for women is 22, available on the Classic Vest for Women ($100). We came across a CNET review of the Xubaz scarf, titled "How to never ever ever get a date again: neckwear edition." It's true: The scarf, which has four pockets that can hold everything from your iPod to your wallet and ID, might not be the first thing you should grab out of your closet if you're getting ready for an appearance on The Bachelor. But for travelers, it's fantastic. The airline's barrage of baggage fees has forced us get creative when packing in order to save money, so why shouldn't we use a scarf as a mini carry-on bag? Besides, this soft accessory offers a convenient place to put an iPod when leaning back for a long nap on a flight. As of publication, the Shop Now link on the Xubaz site isn't working. But there is a map of U.S. retailers on Xubaz.com. According to About.com, the scarves start at $35. Planning on skipping the shower for a while? No judgment here, but if you're going to sit next to me on a plane, I'd prefer that you'd at least be dressed in Icebreaker's Bodyfit line of merino wool hiking wear, available for men and women. (Shirts start at $55.) The shirts, constructed of several breathable layers, are odor-resistant. This doesn't mean you can forgo washing forever and expect to smell like a spring morning. But if you're faced with a string of long flights and stopovers or embarking on a camping or hiking expedition, an Icebreaker shirt is a good bet. Running out of sunscreen on the road can be a serious crisis, especially for those who just about burn under florescent lights. 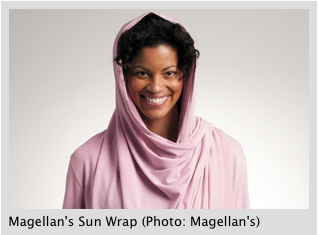 A great back-up product—or, alternately, a product that adds additional armor to your sun-care regime—is the Sun Wrap ($85) from Magellan's. It has a 40-plus ultraviolet protection factor (UVP), as well as long sleeves and a flowy front (drape the front around your head to create an elegant head wrap). This wrap is sized for women. But for men we recommend Magellan's Tilley Outback Hat ($76), which has a 50-plus UVP. Pants that turn into shorts are sold by most major travel-supply stores. We like the Monarch Convertible pant from Prana ($78), which comes in three colors and is made of quick-drying, wrinkle-free fabric. Zip off the bottom and the pants are instantly transformed into knee-length knickers. Prana also offers a similar pair of convertible pants for men ($80). 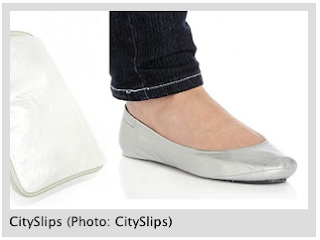 Cityslips were originally designed as back-up shoes for women who couldn't take it anymore when teetering in toe-torturing high heels. But they're also a practical option for travelers. A word of warning: The shoes were not made for a great deal of walking. They're lightweight, bendy, comfy ballet flats that come in a zippered carrying case, but they're not durable enough to handle miles-long strolls. However, I carted a pair of Cityslips on a trip to Europe and found them very handy. They were perfect to wear on the plane. They feel like slippers, yet one doesn't look like a hospital patient when walking to the bathroom or transferring between flights. They were also a convenient choice of footwear when padding around my hotel room or heading down the hall to get ice. 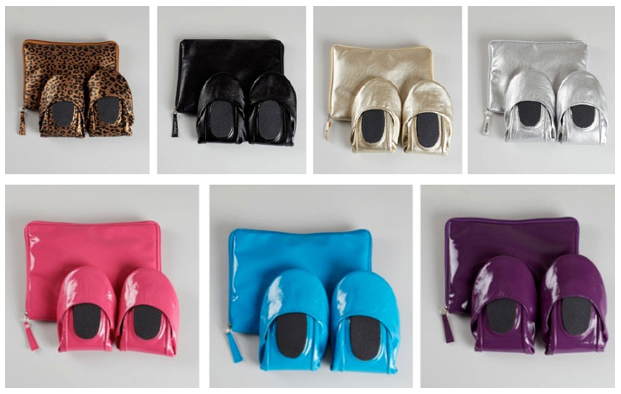 And the best part: The shoes fold into a compact fist-sized bundle that fits easily into a suitcase or even a large pocket. Prices start at $24.95 per pair. This raincoat may not be the most fashionable thing in your wardrobe But really, few people look like a style guru when it's pouring buckets outside anyway. The Welder Raincoat Freecut by Muji, which bears some resemblance to a dollar-store poncho, will at least keep you very dry. It comes neatly folded in a small packable pouch. And it's customizable. Cut at the dotted line around the hem andcuffs of this coat to achieve the perfect fit, no tailor required. 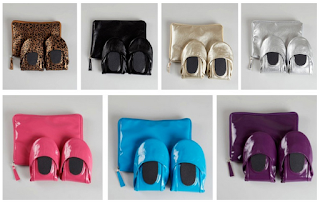 The unisex product comes in four colors and is available online for $12.75 at Muji.us. SmarterTravel editor Caroline Morse recently wrote a product review about Clever Travel Companion, undergarments that have small zippered pockets in which you can stash your passport, ID, and other valuables. These undershirts and pants, which start at $24.90, trump a money belt because they're comfortable and fit smoothly under clothes. It's highly unlikely that a pickpocket will manage to get his hand into the diminutive pocket hidden in the tee underneath your shirt, so the product gets our thumbs-up for safety, too. One caveat: Don't put anything to which you'll need quick access—such as your wallet—in the underwear's built-in pockets. It could lead to an awkward situation at the cash register. This is one of two Exofficio products that made it onto our list: an ingenious travel jacket with a split personality—it doubles as a travel neck pillow. The Storm Logic jacket is a decent piece of apparel to begin with. It's quick-drying and windproof, and it has plenty of pockets. 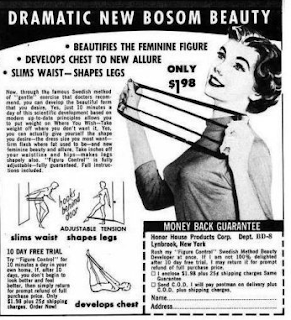 But roll the puffy garment into its special built-in sac and—presto! —it's now a neck pillow. 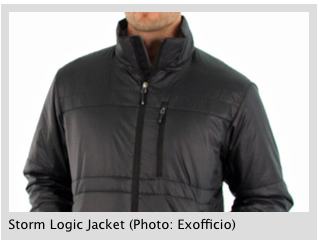 The jacket is available for men or women, and, at time of publication, is selling for $99.91 on the Exofficio website. Again, my road warriors, some of those prices seem high to me. Go to your local thrift shop and approximate the things above. You'll have more money in your pocket for your trips! 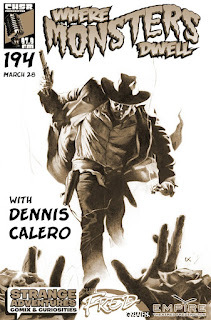 Dennis Calero did a great live interview on "Where Monsters Dwell" Wednesday night March 28th. If you missed it, you can still check it out.--R. 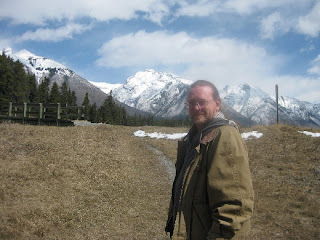 You can go to the website (http://wheremonstersdwell.ca) and click on the archives section. While you are at it, check out some of the past interviews with Michael Golden, Mark Texeira, Nick Cardy and Renee Witterstaetter! Just in time for the release of THE DARKNESS II video game from 2K Games and Digital Extremes, Top Cow proudly releases the over-sized 100th issue of one of their flagship characters. 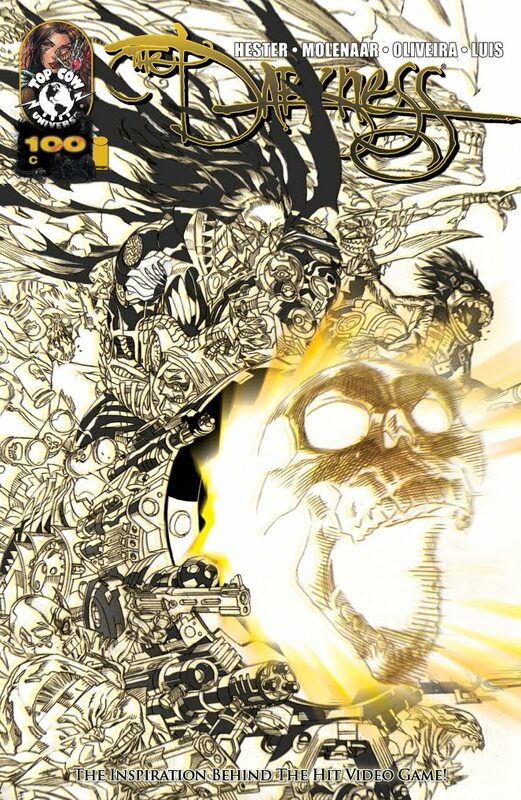 Featuring covers by such lumineries as TODD McFARLANE (SPAWN) and MICHAEL GOLDEN (The Nam, Micronauts, SPAWN) alongside THE DARKNESS artists JEREMY HAUN and MICHAEL BROUSSARD! AND FYI, Michael Golden has been nominated for Best Cover Artist in the CBG Awards. 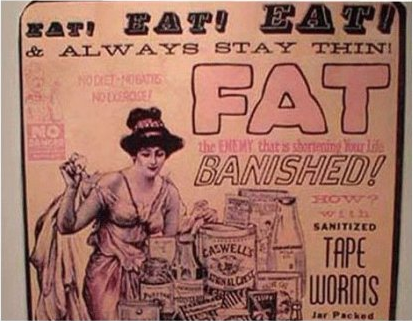 Go Eat a Worm!--Weight Loss Advice of Yesteryear! 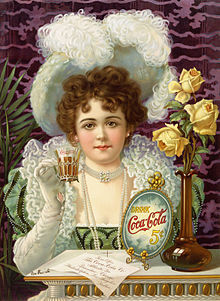 Advertising is NOT a new thing. The Egyptians used papyrus to print their sales messages. 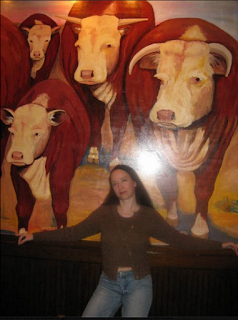 And I suppose cave paintings can be thought of as a sort of outdoor billboard, no? 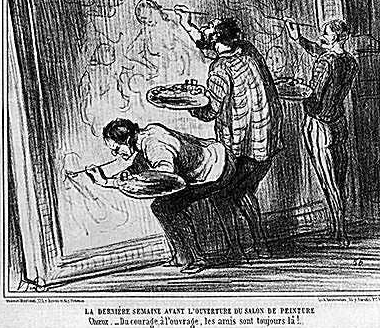 The French newspaper, "La Presse," was the first to actually sell ad space. And the rest is history. Huffington Post ran this article today on one big money niche of advertising: Playing on women's desires to lose weight or have a certain body type. Oh girls, we ARE big business. Having been overweight myself when I was a teenager, before high school, it resonates with the feelings I had at the time... being made to feel less than normal if your body type didn't fit a mold, thinking a little appetite suppressant was going to help and at the same time, being bombarded with the benefits of fast food...and someone on the other side of those commercials racking in millions. And now, here is the article in it's entirety and the original link. Some of these ads are simply fascinating from an archaeological point of view. The cave paintings of our time. Would Don Draper approve these messages? 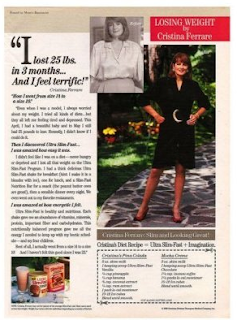 With Mad Men's season five premiere bringing everyone's favorite vintage show back to television on Sunday, we decided to take a look back at the ads that influenced our dieting styles and body images over the years. 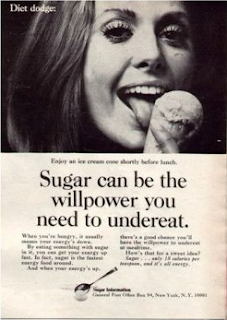 "When you're hungry, it usually means your energy is down," reasons this ad from sugar manufacturers that was in circulation in the early 1970s. "By eating something with sugar in it, you can get your energy up fast." They advertised sugar as only 18 calories per teaspoon and "all energy." Of course, they neglected to mention that immediately after creating a surge of energy, unfettered sugar consumption leads to a blood sugar crash that triggers appetite and brings on fatigue. We don't need to review the damaging effects of cigarettes, do we? Smoking is associated with heart disease, stroke, many different cancers, and emphysema and other respiratory diseases -- just to name a few. In fact, smoking remains the number one preventable cause of death in the United States, killing 393,000 Americans each year. 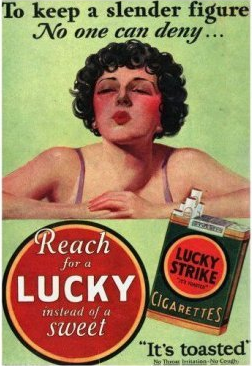 This 1929 advertisement for Lucky Strike cigarettes reveals how tobacco products were marketed to women primarily as a weight loss aid. A good reminder that unrealistic body ideals skew in both directions, this was one in a series of advertisements for slender young women who wanted the voluptuous figure in fashion at the time. 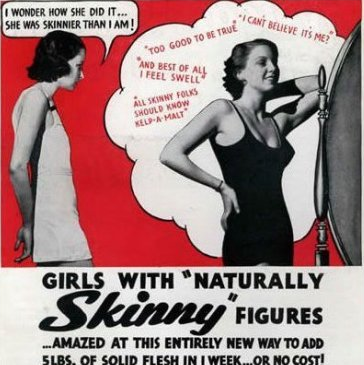 Nothing wrong with a "naturally skinny figure" -- or a naturally any-kind-of figure, for that matter. Ingesting a parasite on purpose, to stay thin? No thanks. While there is some skepticism that pills like these actually contained living tape worms, the notion that a person could lose weight from having a parasite is not totally logical. As Los Angeles Times health writer Elena Conis explained, "Some tapeworm species can bring on not just weight loss, but also malnutrition, nausea, vomiting, diarrhea, anemia and the formation of fluid-filled cysts that can damage organs, block circulation and cause seizures." 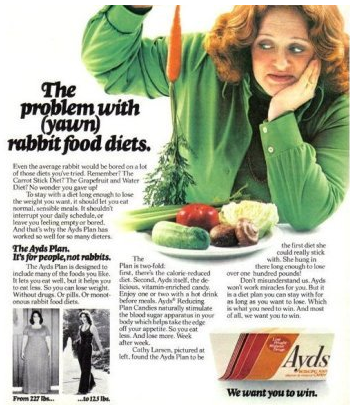 By feeding into the notion that vegetables are tasteless and undesirable, this "dieting candy" company got it all wrong. The vibrant colors, textures and flavors of vegetables are palatable and make you feel good. 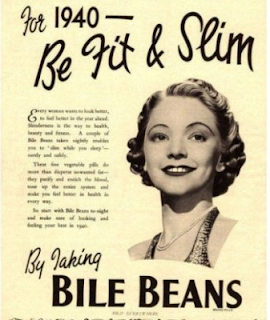 Flavored with chocolate, butterscotch, peanut butter and other candy flavors, the appetite suppressant candies were first made with a local anesthetic, benzocaine, and then with the stimulant, phenylpropanolamine. But clearly, a carrot is the offensive option. 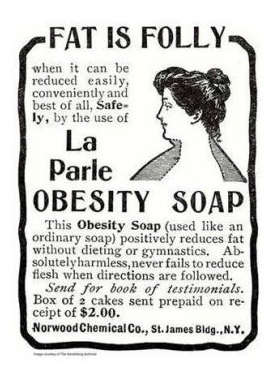 Industrious companies have been trying to sell the idea of a quick fix for weight loss for a long time, as this ad proves. With vague, "fine vegetable" ingredients, the pill company claims that their supplements "redistribute fat" as you sleep. Now we know there are no short cuts: an active life style and careful eating are the only way to achieve a healthy weight. Has there ever been a more clearly stated subtext than appears in this ad? Fat is dirty, the ad implies, and all one must do is simply wash it away. While strength training with bands is an effective and efficient workout that's back in vogue, the resistance exercises can only help tone muscles and improve alignment and strength -- they can't change cup size. 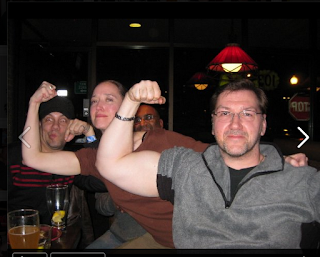 Short of surgical intervention or overall weight gain, nothing can. Replacing meals with processed shakes and bars might help you reduce calories, but that doesn't mean you're getting complete nutrition. Eating a variety of whole, unprocessed foods is a better bet than depriving yourself of meals in favor of sugary shakes. 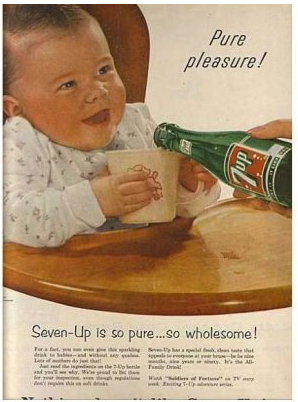 According to this ad, it's never too early to start plying your infant with soda. Why? Because it's "pure and wholesome." This 1956 ad for Seven-Up boasts that the drink comes with an ingredient list on the label, which wasn't required at the time. And while that's commendable, the ingredient list surely revealed how sugary the beverage truly is. We now know that sugar-sweetened beverages like sodas and energy drinks are one of the biggest scourges in the fight against childhood obesity. While much of the current connection between obesity rates and sugar-sweetened beverages are related to growing portion sizes and increased availability, there is no benefit to serving sodas to small children. Eh, all we can do is put on our brainwashing shields and be ourselves. So, go forth, and do. Congratulations to artist Michael Golden for his CBG Fan Awards Nomination for "Favorite Cover Artist." Voting is open until May 31st. And if you are a fan of comics, hey you can vote. One person. One Vote. You WILL count! Michael's work has appeared on the covers of "Spawn" within the last year, as well as many other "frontage" offerings on your local comic book stand. 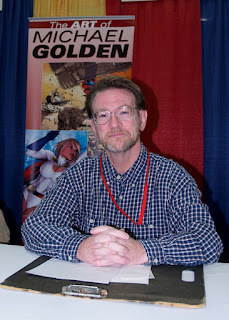 Artist/writer/creator Michael Golden, co-creator of the X-men's Rogue character, Spartan X and Bucky O'Hare, is known worldwide for his groundbreaking work on "Star Wars," "The 'Nam," "Micronauts," "G.I. Joe Yearbook," and "Dr. Strange, " among MUCH more, and is counted as one of the best cover designers and storytellers in the business. 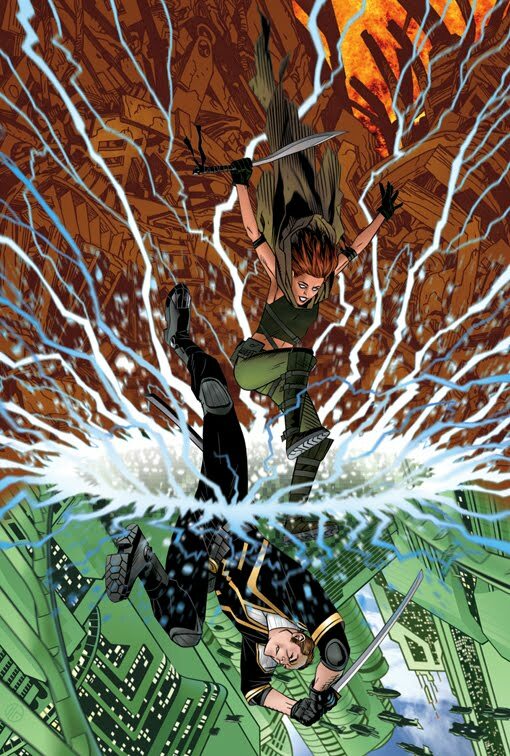 Golden's work can be seen on covers ranging from "Nightwing", to "Iron Man", to "Heroes for Hire", to "Exiles," to "Demon's Regret," to "Spiderman," to "Hulk," as well as numerous other titles, for about every company out there ... including a few secret projects for IDW and others coming to you this year in 2012. Recent books covering the colorful life and amazing art of Michael Golden include a Manga version of the "Bucky O'Hare" series, created with Hama, as well as the top selling art retrospective "Excess: The Art of Michael Golden," written by Renee Witterstaetter, which sold out and has gone into a second printing, as well as his recent sketchbooks "Heroes and Villains," and "MORE Heroes and Villains." In addition, Woodcrest Productions/Eva Ink has also released a two part candid DVD on Michael and his career, entitled "Creator Chronicles: Michael Golden," featuring an extensive interview and tutorial with the creator. Upcoming sketchbooks include "Alchemy" and "Dangerous Curves." Kansas City Here we Come! Planet ComiCon this Weekend! 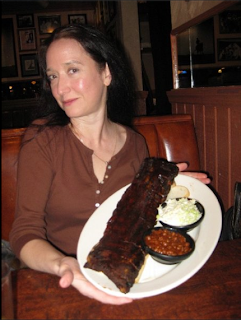 Few places in the world are as associated with BBQ as my next destination, Kansas City, and although they put on one darn good comic book convention there, I have to say, that second (or maybe first) on my agenda, will be getting a rack of Dino ribs at Jack Stack while I'm there. Run by the good folks at Planet ComiCon, Chris Jackson, Matt Driscoll and Sidne Ward, this show, aptly named "Planet ComiCon," also offers an opportunity to attend a good ol' fashioned comic book show, with a few media guests, but with attention paid extremely well to comic book creators to boot. A nice mix. They always boast a fantastic artist alley in fact. This year, myself, Michael Golden and Mark Texeira will be returning to KC for this 2 day event. Sketch books, and drawing pencils in tow. So, Kansas City, here I come... I'm even traveling by train in my little sleeper car, which for some reason strikes me as nostalgic and puts Willie Guthrie tunes in my head. While the song of the same name has me dancin' a little West Coast Swing on the way. And as I look forward to new memories and seeing old friends, here are some images from Kansas City Planet ComiCon's past! ....and loved it. Simply because among the things I appreciate are determined forward thinking, entrepreneurs, and a good glass of wine (mostly red). As for the craft...Indeed, I've tried it myself. When I bought my 150 year old house in Connecticut, it came complete with it's own Concord grape vines. I was told by the previous owners that their old world Italian grandfather use to make gallons of red wine with this variety in the garage out back, and served it for his weekly card games with his friends. These beautiful vines were at least 100 years old. So, taking that as a challenge, I found a supply store in nearby Milford and bought all the equipment to start making my own wine-- fermenting jars, valves, instruction books, mini wine press. You name it. 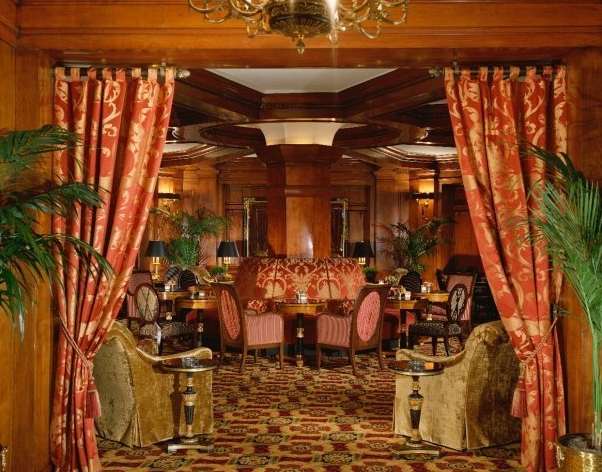 I had visions of grandeur... or at least grand vino... in my mind. I did all of that, in fact. Everything that the books said one MUST do to get good results. Not all was lost though. 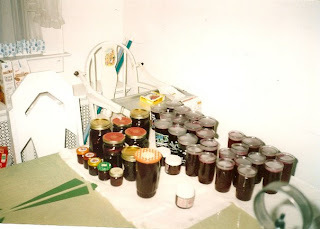 With my Mother's help, I found that the Concord Grapes DID make amazing grape jelly! And THAT, on homemade bread, makes for something really magical, I tell you. 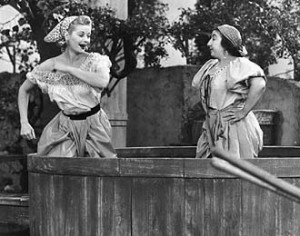 But without further ado... here's to the pioneering women of wine-- the ones much more successful at that craft than I. :-) But I'll put my and Mom's grape jelly up against theirs any day! A few centuries ago, at the dawn of the French Revolution, one women changed the world of Champagne and in turn the world of wine forever. 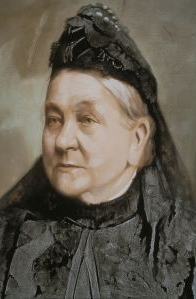 Nicole-Barbe Ponsardin, better known as the Veuve Clicquot, revolutionized the Champagne trade, invented the riddling technique and sought brand identity by selling her wines with the iconic orange cap. Since then, from Burgundy to Alsace to Australia, women have shaken up the traditional man’s world of wine. 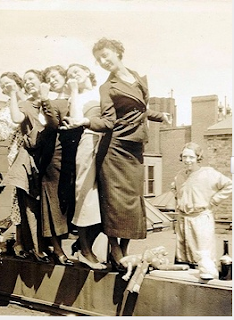 Here are some of those trailblazing women and the wines they made famous. Another widow, and a contemporary of the Veuve Clicquot, who took over after her husband’s death was Mary Penfold of Penfold’s in Australia. Before and after her husband’s death in 1870, she ran the estate, supervised blending and experimented with varietals. By the 1870s, Penfold’s claimed to be selling one-third of all wine in South Australia. 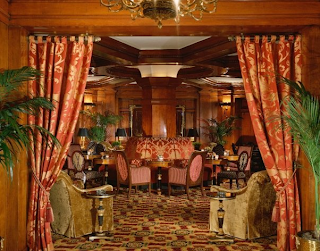 After her death, her contribution was largely forgotten and her husband’s name is the one on the history books, but her strong support and hard work laid the foundation for the once-fledgling estate to become the success it is today. A true pioneering female, Zelma Long flung herself upon the scene in the 1960s. After enrolling as only the second female at the University of California at Davis, she took a job at Robert Mondavi during one harvest. 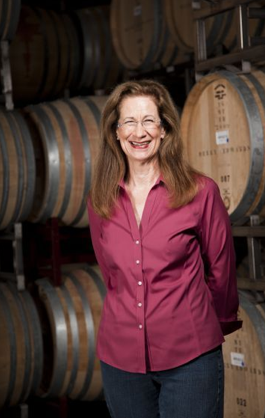 Quickly working her way up the ladder, she became the head winemaker at Robert Mondavi and Simi. Eventually, she became the president of Simi and then the executive vice president of Chandon Estates. Long is currently the head winemaker and co-owner for the Vilafonté project, a joint California and South African project, as well as for Long Vineyards in the Napa Valley. After brief stints at Robert Mondavi and Chappellet Turley was unable to find a wine making job in California, so she took a job making wine in Kentucky. After returning to California a few years later, she worked at B.R. Cohn, then Peter Michael and eventually Turley Wine Cellars. A pioneer in the Sonoma Coast area, Turley planted grapes there when others thought it too cool to for them to grow. This project eventually turned into Marcassin, one of California’s premier Pinot Noir and Chardonnay labels. In addition to her own label which is available through an almost impossible to get on wait list, she has consulted for other auction-friendly wines like Colgin Cellars and Bryant Family. Another successful female coming from California, Merry Edwards, the eponymous owner of Merry Edwards Winery in the Russian River Valley, has had her share of successes and obstacles during her career. Starting as an amateur making The Merry Vintners wines during college, she turned her love for wine into a successful career. 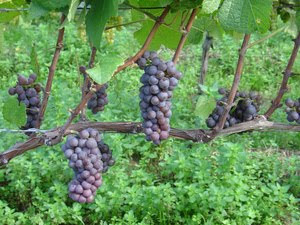 An early-believer in clonal variation, she studied and tested different clones of Chardonnay in an effort to prove her hypothesis on the differences between clones of the same varietal. She was the founding winemaker for Matanzas Creek until 1984, and after a few career setbacks during the 1980s, she went on to found her own winery with help from her family in 1997, where she has been producing wine ever since. 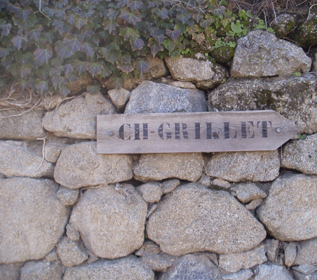 Château-Grillet, one of only two single-appellation estates in all of France, produces what is arguably the best Viognier in France. While Isabelle Barantin-Canet did not found this well-known estate, she manages the production, which is located in the Northern Rhône. Her family owned the estate from 1830 until 2011, but she still oversees production and sales of the wine. 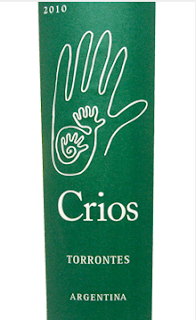 Produced in small quantities every year, this wine fetches high prices and demands respect the world-over. 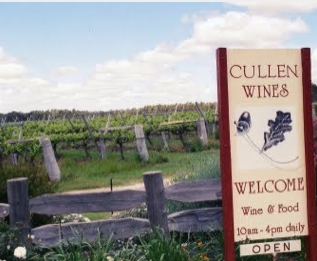 One of the original vineyards in the Margaret River region of Western Australia, the Cullen estate was influential in establishing this region as a quality wine-producing area during the 1960s. Diana and her husband, who together founded the estate, experimented with different varietals during the first few years. Leaving her career in physiotherapy, she became the full-time winemaker. During her first year, Cullen won a trophy at the Perth Royal Wine Show, the first woman to do so. Eventually, her daughter Vanya went on to take over the production duties, earning ever-more awards and recognition for her family’s estate. Hailing from Argentina, Susana Balbo has made a name for herself inside and outside her country. 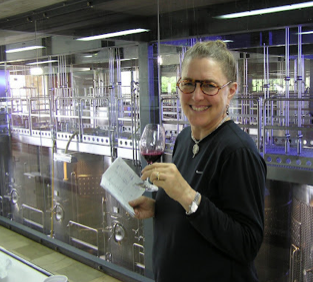 She was the first Argentine winemaker to be hired as a consultant at European wineries and has made wine in Spain, Australia and France, among others. Every year, she spends one month in another country learning different wine making techniques. She works with her family’s estate, Dominio del Plata, and started her own line, Crios de Susana Balbo, named for her children. In 2011, Susana passed the winemaking reins to her son, José, who continues her vision. Here's a toast to you ladies. I'll try to find all of your wines (at least if they are reds) and give them a try. And if you reading this are a wine enthusiast yourself, you can sign up for the Snooth.com newsletters. They are alot of fun! Wonders at WonderCon-- Golden "Special Guest"; Calero Added to line-up! Anaheim, CA-- WonderCon, one of the country's best comics and pop culture conventions, moves to Anaheim, CA and the beautiful Anaheim Convention Center for 2012 with Special Guest-- Michael Golden in attendance for the first time. Also from Eva Ink Artist Group, we are pleased to announce that artist Dennis Calero and writer Renee Witterstaetter will also be attending this West Coast mainstay event. Taking place the weekend of March 16-18 (Friday, Saturday, and Sunday), WonderCon is coming off its best year ever, with over 49,000 attendees in its 25th annual event. 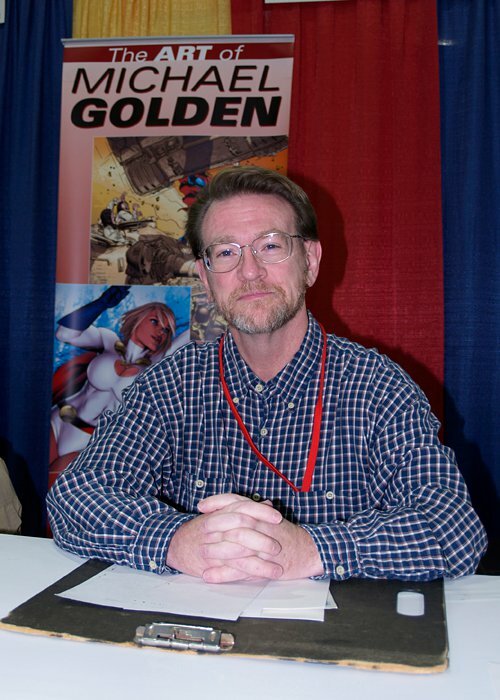 Artist/writer/creator Michael Golden, co-creator of the X-Men's Rogue character, Spartan X, and Bucky O'Hare, is known for his groundbreaking work on The 'Nam, Micronauts, G.I. Joe, Dr. 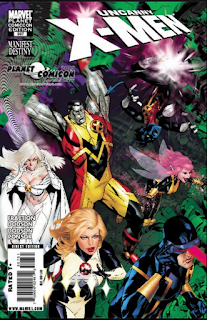 Strange, and numerous other characters and titles. He is counted as one of the best cover designers and storytellers in the business. 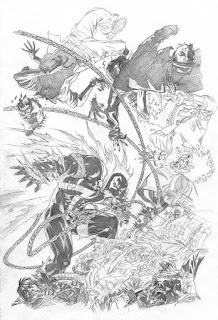 Currently, Golden's work can be seen as the regular cover artist for Spawn, while future work includes a few secret projects for IDW and DC and the Spartan X trade paperback. Dennis Calero is the award winning and internationally recognized artist of X-Men: Noir and Legion of Superheroes. His work includes 28 Days Later: The Aftermath, Cowboys and Aliens, Dark Tower, Fallen Angel, Hawkgirl, Star Trek: The Next Generation, Supergirl and the Legion of Superheroes, Magic The Gathering, Countdown to Final Crisis, Wolverine: First Class and JSA Classified. During his tenure on X-Factor the title was nominated for the Harvey Award for Best New Series (2006). Calero also co-founded Atomic Paintbrush, one of the first computer-coloring companies working in the comic-book field. WonderCon will take place at the Anaheim Convention Center this year, which is within easy walking distance of Disneyland's free Downtown Disney district, featuring shopping and fine dining. WonderCon itself offers attendees, professionals, and exhibitors the complete convention experience. In addition to the Exhibit Hall featuring comics and items from the many worlds of the popular arts, fans can expect exclusive programming from the top comics publishers in the country, movie and television panels, anime, autographs, games, the Masquerade, and portfolio review, providing one of the best conventions out there. With the change of venue to Anaheim in 2012, WonderCon is more than ever a "must-attend" event on the convention calendar, especially with the addition of the beautiful Anaheim Convention Center and surrounding area as a bonus to both long-time and new attendees. Make it a long late-winter weekend in Anaheim and visit WonderCon, then take in Disneyland right next door after the convention! But for that first bit of "wonder," stop and visit Golden and Calero at the show!